Locus Online is hosting, during the month of November 2012, a poll for the best novels and short fiction of the 20th and 21st centuries, the first such poll Locus has conducted since those hosted by the Magazine in 1975, 1987, and 1998 (with an online supplemental poll in 1999). The scope for this poll is the 20th century, 1901 to 2000, and the first decade of the 21st century, 2001 to 2010. There are five categories in each century: SF novel, fantasy novel, novella, novelette, and short story. For 20th century categories, you may vote for up to 10 items in each category; for 21st century categories, you have the usual 5 items in each. Results will be scored based on rank, so that a 1st place vote is worth twice as much as a 5th or 10th place vote, but not 5 times or 10 times as much. The poll closes tomorrow and I’ve been putting it off all month. I imagine other people have being doing the same so I thought I’d post 21st Century lists as a prompt for other people to get their finger out. Please feel free to defame these choices below. I also recommend reading Nina Allan’s choices, particularly if you are after short fiction recommendations. Exhibit A: The prologue of Railsea by China Miéville. This is the story of a bloodstained boy. There he stands, swaying utterly as any wind-blown sapling. He is quite, quite red. If only that were paint! Around each of his feet the red puddles; his clothes, whatever colour they were once, are now a thickening scarlet; his hair is stiff & drenched. Only his eyes stand out. The white of each almost glows against the gore, lightbulbs in a dark room. He stares with great fervour. The situation is not as macabre as it sounds. the boy isn’t the only bloody person there: he’s surrounded by others as red & sodden as he & they are cheerfully singing. The boy is lost. Nothing has been solved. He thought it might be. He had hoped that this moment might bring clarity. Yet his head is still full of nothing, or he know not what. 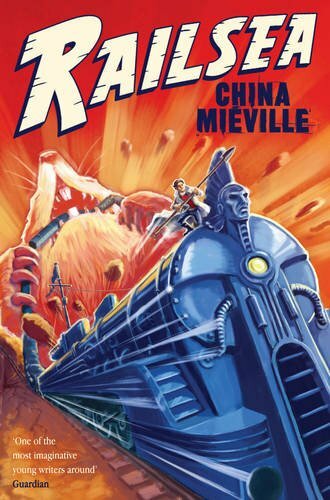 Exhibit B: The new cover for Railsea by China Miéville. Talk about tonal dissonance and false expectations!